To think of disability inevitably conjures up thoughts of age, class, gender, sexuality, ethnicity, race, indigeneity and nationality. Such intersectional considerations are at the heart of what has been termed critical disability studies (Goodley 2011; Shakespeare 2013), where disability links together other identities as a moment of reflection that Lenny Davis (2002, 2006) coins as dismodernism. While critical disability studies might start with disability, they never end with it: remaining ever vigilant of ontological and theoretical complexity, as well as complexity in terms of political, cultural, social and material issues (Goodley 2011). Such complexity is extended further when one thinks about the place of disability: where and when disability appears. Disability emerges geopolitically (in terms of location), temporally (by way of differing historical moments) and epistemologically (considering, for example, disability’s varied disciplinary dwellings). We are interested in those varied terrains where we might map and locate disability but this journey, perhaps inevitably, involves much crossing of national and theoretical borders. 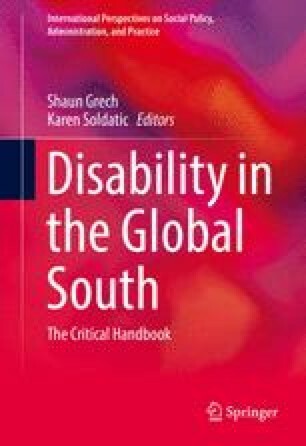 In this chapter we will consider a number of ways in which we might place disability, including a global north perspective, a supranational discourse and a global South response. In our geo-theoretical journey we will consider the troubles associated with conceptualising disability. We conclude by thinking through the complexities borne out of this recognition of the local and global placing of disability. Parts of this chapter are reproduced by permission of Sage Publications, © from elements of chapters 1, 4 and 5 of D. Goodley (2011), Disability Studies: An interdisciplinary introduction, London: Sage.